In front of a season-high 5,103 fans, No. 20 Florida (26-13/10-7 SEC) notched an 8-4 victory over No. 16 Ole Miss (27-11/10-7 SEC) on Saturday afternoon at McKethan Stadium to even its weekend series. Senior Stephen Locke (2-0) went 7.2 innings for his second-straight win, junior Mike Mooney was 3-for-4 and scored twice and the Gators were able to convert four errors into five unearned runs. The Gators capitalized on a two-out error to seize a 1-0 lead in the first inning. Freshman Daniel Pigott doubled with one down off junior Phillip Irwin (5-3) but was cut down at the plate trying to score on senior Avery Barnes’ base-hit, as senior right fielder Jeremy Travis fired a perfect strike to senior catcher Kyle Henson. Following a walk to freshman Preston Tucker (2-for-4), sophomore Josh Adams’ grounder was misplayed by UM junior third baseman Zach Miller, allowing Barnes to tally the game’s initial run. Locke retired the first seven UM hitters before yielding a one-out single by junior Kevin Mort in the third. Junior Jordan Henry (2-for-4) sliced a two-out single before Adams made a backhanded stop on Henson’s ground ball to force Henry at second base and close the stanza. Locke departed with two down in the eighth after permitting a single to Miller. Over 7.2 innings, the southpaw scattered eight hits, gave up four runs and registered five strikeouts. Freshman Anthony DeSclafani had senior pinch hitter Michael Hubbard fly out to retire the side and set down the Rebels one-two-three in the ninth to complete the victory. 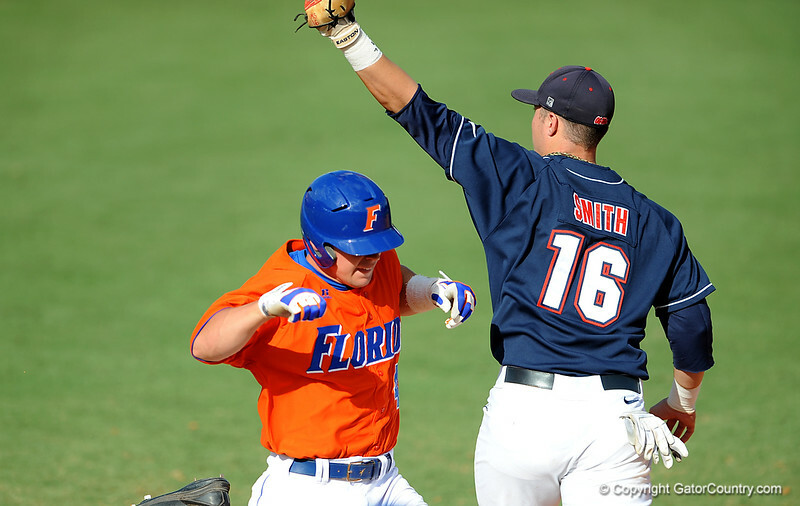 Eight of Florida’s nine starters contributed a hit as the hosts enjoyed an 11-8 advantage. The Gators did not commit any errors, improving to 9-1 this season when playing mistake-free. Baker threw 4.2 innings out of the pen for UM, allowing three hits and one run.